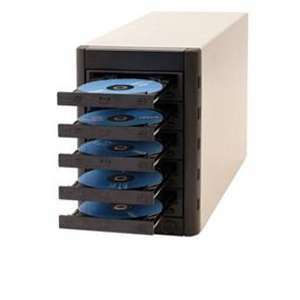 Get a new generation disc multiplier with the Microboards Multi-Writer Blu-Ray Tower! 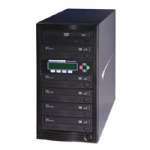 This disc multiplier lets you directly copy and burn your PC hard drive files through the eSATA or PCI Express cables. This is a significant advancement from the traditional models where one disc is cloned into multiple discs with the ability to record different data in different drives independently. It is compatible with any disc formats including Blu-ray Discs, DVDs, and CDs. As the connection is achieved through an eSATA or PCI Express cables it can go through with its operation in blazing high speeds. You can access jaw dropping speeds at the rate of 12x BD-R, 2x BD-RE, 16x DVD-R, 6x DVD-RW, 16x DVD+R, 8x DVD+RW, 8x DVD+R DL, 8x DVD-R DL, 40x CD-R, 24x CD-RW. A Zulu2 Disc Mastering software enables you with a friendly interface that will guide you through each step of disc set up, drive and writing jobs. It is made to be compatible only with Windows XP and Vista. 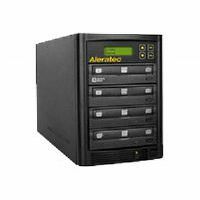 Gets the new disc burning technology in Microboards Multi-Writer Blu-Ray Tower!